I really wanted to love this book. Like, really really really wanted to love it. 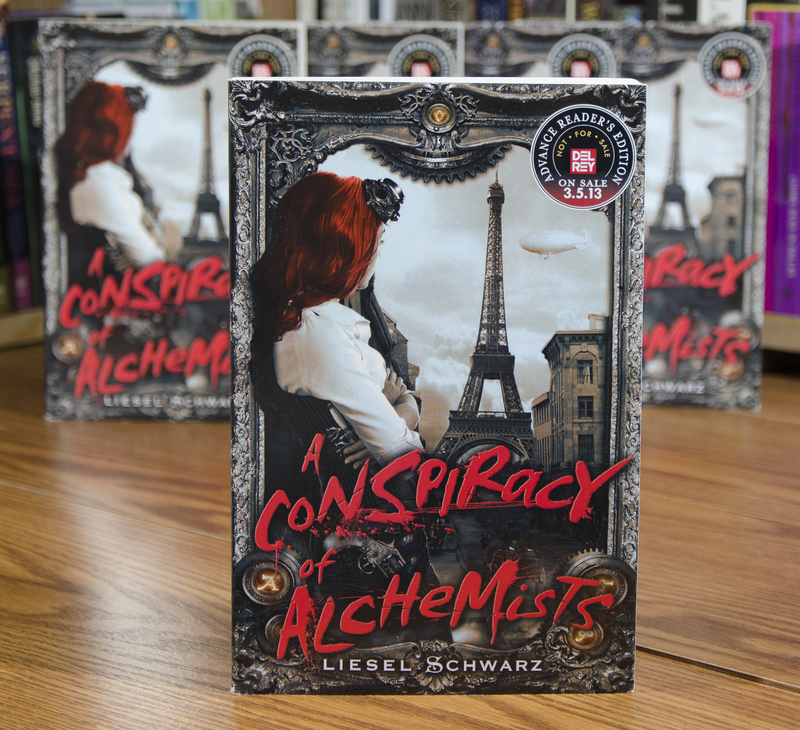 Not just because reviewers were hailing Liesel Schwarz’s first installment of The Chronicles of Light and Shadow as “a superb debut novel” when it was released in 2013, but also because I picked it up at Weekend at the Asylum in 2014 and it gave me warm fuzzies just thinking about the convention. Unfortunately, you can’t always get what you want. Here’s what went right. Schwarz started with a very interesting concept. The world is divided into “Light” and “Shadow,” Light being science and logic, and Shadow being the supernatural. There is only so much energy out there (in the ether? universe? it was unclear) to sustain both sides, so as one rises the other side suffers. The Industrial Revolution and its precursor, the Age of Enlightenment, are elements of the Light side of things and so the Shadow world has been losing ground and they are getting desperate. The book is populated by warlocks, alchemists, vampires, and fairies, as well as really retro-futuristic technology and inventors. The central figure was a female, mechanical genius and airship pilot. So far so good. Our heroine, Elle Chance, gets sucked into a plot by the alchemists who want to seize control from their vampire overlords by kidnapping Elle’s father, a famous inventor. They intend for him to him to build a machine that will channel energy from the Shadow’s greatest source, the Pythia, to keep them from falling away under the influence of the Light. As Elle soon discovers, she is the next in line for the office, but the process is just as likely to kill her as to save the Shadow. This adventure takes her all over the world, and I loved that her time in England was merely a pit stop so the story was more multicultural than most. There are also some sections that are told through the eyes of a fairy who is living in a bracelet Elle is wearing, which was a novel approach and I liked it as a concept. Here’s what didn’t work. I hated the protagonist. Like so many sci-fi/fantasy heroines, she is “feisty,” which I find often just means argumentative and stubborn, which Elle certainly is. Frankly, I found her to be quite thick-headed. There are times that she asks questions which are clearly for the benefit of the reader but just read so bone-headed they are distracting. Any person actually living in a world where artists actively seek the aid of absinthe fairies and you can casually encounter a vampire on the Orient Express would know the answer to her queries even if she tries to stay our of Shadow affairs. There is also a time when her romantic interest tells her “Touching you is like drinking from a cool clean fountain after suffering from a great thirst. It is… perfection… But I know what that will do in time. We cannot. We must not.” And she takes it as an outright, he’s-just-not-that-into-you type of rejection. Was she even listening?! I also felt like the writing was hit and miss. There were turns of phrase and descriptions that I really liked, but there were some real structural problems that turned me off. I always finish books once I start them, but it was more of a trudge than the whirlwind adventure I was hoping for. I actually blame Schwarz’ editor for the problems I found more than the author. For instance, there were chapters that ended in an absolute, resounding THUD. There were other chapter endings that were meant to propel the reader forward like “a storm was coming” but there was no storm, and after Elle discovered her father’s flying machine it ended with “She had a plan”, but there actually was NO PLAN aside from ‘make machine go.’ There was not yet enough information to make a plan so it seemed like the chapter had perhaps been lifted and moved to another place without being edited properly. The most interesting part of the story actually comes in the epilogue, which many people will not read. I wish Schwarz hadn’t withheld the information from the main narrative. I am sure she was thinking about setting up the next book, but it would have added a more interesting dimension to the characters and story, which was a pretty dull supernatural romance as much as anything. Phoebe Darqueling is a writer and artist who is inspired by Steampunk and the Victorian era. Keep a look out for her debut novel, Riftmaker, in 2017!